5. Gatwick: Save time at the airport - book online! "Easy and convenient. Very fast." Visit the beautiful Kensington Palace in the heart of London, a place filled with secret stories. Kensington Palace has home to many royals from Queen Mary to Princess Diana and has long served as the stage for some of Britain's most sizzling drama. The place is bursting with history and has lots of activities for the whole family! Save 15% and take a spin on the London Eye and follow it up with a scenic, guided 40 minute London Eye River Cruise with this special combination ticket offer. Book tickets today and enjoy the views! 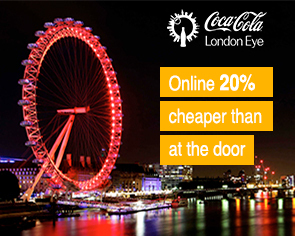 Experience the amazing views of London from the London Eye and save up to 20%! Book your London Eye Flexi Ticket from home and enjoy the freedom to plan your London visit as you like and save. Enjoy an unforgettable day everyone will love! Visit one of northern Europe's largest churches - St. Paul's Cathedral. Learn about its fascinating history and climb to the top of the famous dome to enjoy the view over London. Experience the magic - join our once-in-a-lifetime fully-guided tour of Warner Bros. Studio London - The Making of Harry Potter. Travel by train directly to Warner Bros. Studio where you will enjoy timed access and see the original sets, props, and costumes from the eight Harry Potter films. See all there is to see in London and save on 1, 2 or 3 Day Hop-on Hop-off Big Bus Tours. Save money and see London at your own pace. All tickets include a complimentary walking tour, and river cruise. Book tickets online today! Enjoy an unforgettable day soccer fans of all ages will love! Go behind the scenes at Arsenal Football Club's home, Emirates Stadium, on this self-guided audio tour and see what goes on before a match. Book your tour here to see the locker room, walk down the tunnel that leads to the field, and imagine the roar from 60,000 fans! Ride an iconic red double-decker bus in London and see the entire city. It's a particularly fun way to explore the city and see all the major sights. Book your 24 or 48 hour Hop-On Hop-Off tickets today! The tour of Stamford Bridge, home to Chelsea FC, takes to behind the scenes to one of the world's best soccer teams and gives to access to areas normally reserved for the players and officials. You also get access to the Chelsea FC Museum. Get your tickets here! Visit one of the few remaining working royal palaces in the world today, Buckingham Palace in London! Buckingham Palace serves as both the office and London residence of Her Majesty the Queen. The popular tourist attraction is often sold out long in advance, so book your tickets before you leave home now! If you haven't already ventured outside London, to experience the incredible Stonehenge, now's your chance! Enjoy an afternoon visiting Stonehenge and explore this spectacular UNESCO World Heritage Site on your own with an informative audio guide. Save 15% when you book your London Eye with champagne tickets here, and skip the line! Enjoy a glass of champagne while you take a ride on the London Eye - there's simply no better way to enjoy the stunning views of London. Don't leave London without experiencing the London Eye!